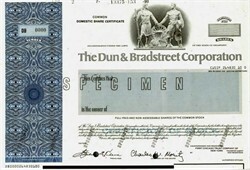 Beautiful engraved specimen certificate from the Dun & Bradstreet Corporation. This historic document was printed by American Bank Note Company and has an ornate border around it with a vignette of two allegorical men. This item has the printed signatures of the Company's Chairman, Charles W. Moritz and Secretary. Dun & Bradstreet traces its history back to July 20, 1841, with the formation of The Mercantile Agency in New York City by Lewis Tappan, later called R.G. Dun & Company. The company was formed to create a network of correspondents who would provide reliable, objective credit information. 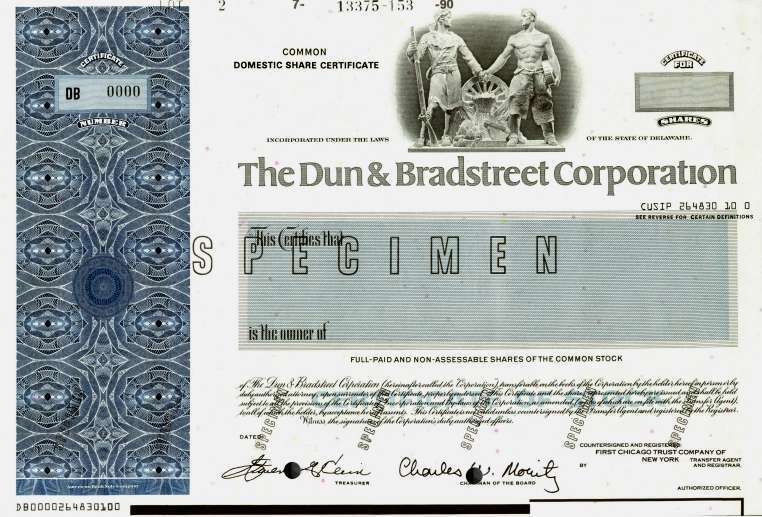 In 1933, Dun merged with competitor John M. Bradstreet to form today's Dun & Bradstreet. The Data Universal Numbering System (DUNS) was invented in 1962. Dun & Bradstreet maintains a database of over 213 million companies globally and over 53 million professional contact names using a variety of sources including public records, trade references, telco providers, newspapers and publications, telephone interviews and others, often without the consent of the business owners or operators it lists. The company derives revenues through subscriptions as well as pay per business report, and to a smaller extent, third-party licensing agreements. Additional revenue is derived from subsidiaries including Hoovers and AllBusiness.com. Additionally Dun & Bradstreet's information on private individuals is also now also used in the so-called "people search" industry where it is sold to (and subsequently publically published) by stalker and people search websites such as CorporationWiki.com and findthecompany.com, again often without the consent or knowledge of those being listed. In August 2010, D&B spun off and sold their credit monitoring and management business to a newly formed company, Dun & Bradstreet Credibility Corp. The company previously spun off Moody's and Nielsen. D&B spun off Cognizant Technology Solutions as an independent organization in 1996. Dun & Bradstreet products and services fall into three categories: risk management, sales and marketing, and supply chain management. Risk management products include the Business Information Report, Comprehensive Report and the DNBi platform, often offered to listed participants as a way to improve their rating. These provide current and historical business information primarily used for third party marketing. Sales and marketing products such as the DUNS Market Identifier database, Optimizer, and D&B Professional Contacts provide sales and marketing professionals with business data for both prospecting and CRM activity. Charles W. Moritz took the helm of D&B just after it had acquired the major market research firm, A. C. Nielsen. Moritz led the successful integration of D&B�s largest acquisition and established a pattern of smooth and profitable mergers. Under his leadership, D&B retained its position as the premier provider of business information services, improved its on-line capabilities, and produced excellent financial returns for nine consecutive years.